Good bag if purchased on a discount. Steep and cheap will occasionally have deals for this bag at around 110 bucks plus shipping. 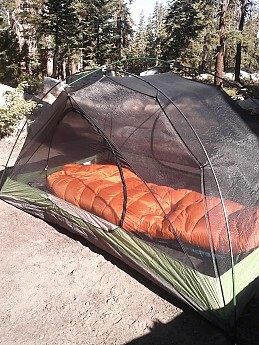 Not the lightest and doesn't pack down to be the smallest out there, but it does the job. Plus... it's DOWN! I got the Sierra Designs Ridge Runner 30 on discount through campmor.com. I paid approximately 120 dollars for the bag and pulled the trigger on the "long" version with the left zipper location. 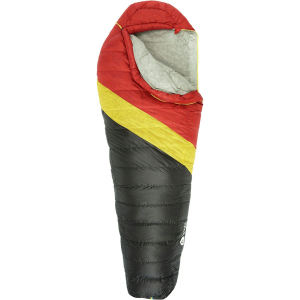 It's the first down sleeping bag I've ever owned, as I have previously only used synthetics. After using a down bag, I don't think I'm ever going back to synthetics. One of the pluses of the bag is the high loft. The bag lofts up and expands when taken out of the stuff sack and provides ample comfort and warmth. I do notice a feather here and there during use, but that's somewhat expected. The long version provided more than enough room for me (at 6'0 150 lbs). Furthermore, nothing really beats the comfort of down. Whether it's the added warmth, the high loft, or simply just laying on top of it during warm nights, down fills are the way to go. The bottom sleeping pad ties also fit my NeoAir Trekker nicely, in which I was never off my sleeping pad (except for the one time my dog got inside my sleeping bag and pushed me off my sleeping pad, but that's another story altogether). For the price that I paid, the Ridge Runner is a great purchase. However, at full price, I would suggest other, lighter options. 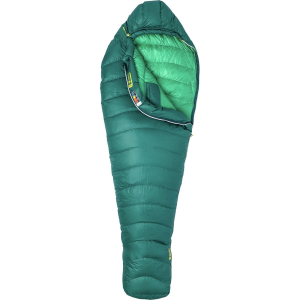 For example, if you don't mind waiting, you can purchase an Enlightened Equipment 40 Quilt for only 50 bucks more and have a pound plus in weight savings, while losing only 10 degrees in warmth. I've used the bag mainly in mild conditions where temperatures rarely dropped below 40 degrees. This bag is very warm in such conditions. I will have to see how this bag will hold up in colder conditions, but I mainly camp in mild conditions and stick to the front side of the Angeles Forest during the winter, so for me, a 3-season bag is perfect for my intended use. I would agree that sometimes this bag is a little too warm in warmer temps... which is not a problem at all during my backpacking trips in mild conditions. The weight and pack size is somewhat of an issue, in which it takes some effort fitting the bag at the bottom of my Osprey Talon 44. Luckily, the Talon 44 includes a bottom zipper which eases the packing of the bag. I usually stuff the hood with my Patagonia Down Sweater for a pillow and it provides great comfort. Exiting and entering the bag is not too much of an issue. While exiting/entering, the zipper of the Ridge Runner 30 does occasionally snag, but has not caused any damage or rips due to snagging. It does take a little effort to stuff the bag in the provided stuff bag.. but due to the size of the current pack that I use, I wouldn't want to use a larger stuff sack to ease this process. I've never had the unfortunate circumstance of getting this sleeping bag wet, so I cannot comment on how well this bag dries. However, since it is down, I would assume it would be difficult to dry when wet, especially compared to other synthetic options. For those on a budget, sign up for a steep and cheap alert, and try to snag this bag at a discount. It's a great bag for the price, in which I have seen this bag for as low as 110 bucks on SAC. 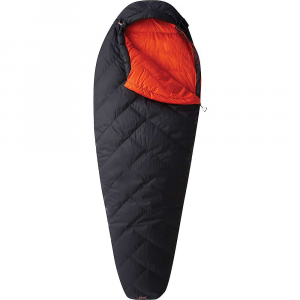 However, if a full price Ridge Runner 30 at 200 bucks is an option you're looking at, I'd look for other lighter options, including the aforementioned Enlightened Equipment Quilt, down bags from GoLite, and any other 200-300 dollar options out there. Good bag — light, packs small, warm to 30 degrees. I used this bag for a week camping trip — experienced snow, rain, and warm temps. Temps on 1 snowy night dropped below 30 degrees and I used a small, light fleece blanket for added comfort but this bag would probably be ok down to 25 degrees. Definitely fine on its own for 30 degrees plus. A little too warm for anything above 40 degrees but unzip the side and get some air in and all is good. No moisure build up, good airflow using the zipper. Hood was a little awkward to get comfortable in but good overall. I had my air pad strapped in too tight to zip zipper — loosened pad straps and all was better, awkward to zip past shoulders — hard to reach zipper and hard to get a good angle to zip. No major complaints though. Good bag for the price! After a summer of use I can say I love this bag and wouldn't trade it for any other (unless for temp rating issues/needs). Temps ranged from 70's down to low 30's and I was fine in my bday suit inside of this bag. I think we got down in the 20's one spring Moab weekend and I needed a thin fleece blanket for some added warmth but not bad for a 30 degree bag. Material is soft and comfortable. I lose a feather here and there but the bag has held up to lots of packing and unpacking very well. Love it! The Sierra Designs Ridge Runner 30 is not available from the stores we monitor. It was last seen May 7, 2014	at Moosejaw.